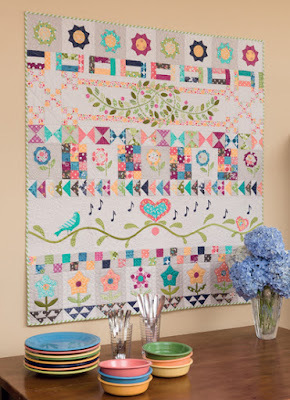 Have you seen the book " Moda All-Stars - All in a Row, 24 Row-by-Row Quilt Designs" compiled by Lissa Alexander and published by That Patchwork Place? Oh... the eye candy! 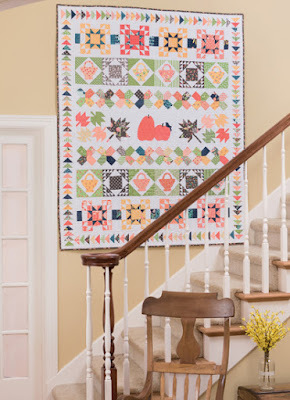 Lissa gathered 24 top designers for Moda Fabrics and they created wonderful row-by-row quilts that are sure to please quilters everywhere whether they like to make whimsical, seasonal, or classic quilts (this is actually how the designs are grouped in the book). 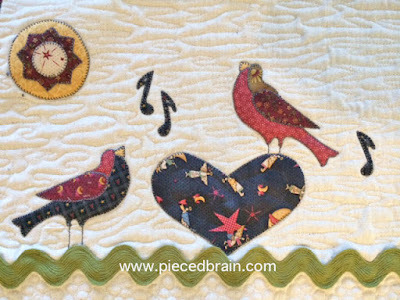 The projects feature a combination of piecing and appliqué and, although they look very elaborate, quilters of every skill level will be tempted! I suggest you skip to the Gallery section and drool over the projects as you decide which one to make first (because I am sure you will want to make them all!). Photographs from "Moda All-Stars - All in a Row, 24 Row-by-Row Quilt Designs" by Lissa Alexander and published by That Patchwork Place, 2016; used by permission. Photography by Brent Kane. All rights reserved. 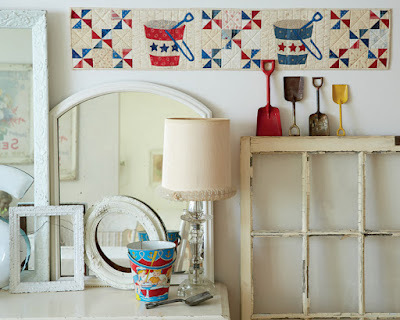 So... what about the table runner (or wall hanging) pictured at the beginning of this post? Well, I woke up in the middle of the night and could not decide which one to make. 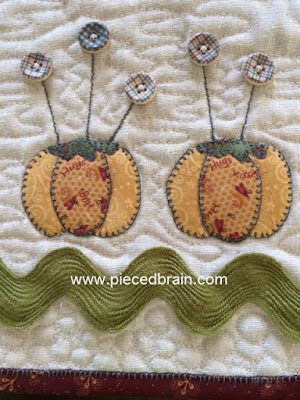 Since I wanted to work with appliqué, I selected motifs from the book by Betsy Chutchian, Karla Eisenach, Sandy Gervais and Sandy Klop and made my own row... Combine beautiful motifs and a bunch of your favorite scraps and there you have it! 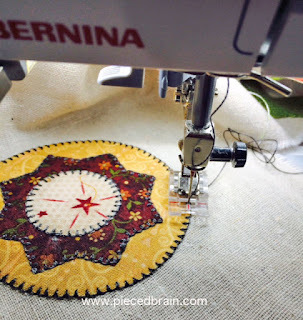 I appliquéd all motifs using Aurifil 40 wt (and 50 wt in the bobbin). I am happy I chose to work with gray (although the picture on the left makes it look black). I wanted a lot of different textures on this project so the 40 wt thread was perfect. The background is 14" x WOF of Osnaburg. The lighting on the photo above is sort of weird, but you can see how I free motion quilted the project: organic lines for the sky, pebbles below the ricrac. I decided to try something new and bound the quilt with the same machine blanket stitch I used on the appliqué shapes. I like it! How do you like the 'pins' on the pincushions? I am loving them! This book has amazing projects and tons of inspiring ideas. What I like best about this book is the fact that all the contributing designers donated their royalties from the book's sales to benefit No Kid Hungry (nokidhungry.org), a charitable organization whose work aims to end childhood hunger through school breakfast programs. Yeah - another reason to have this book in our quilting library! 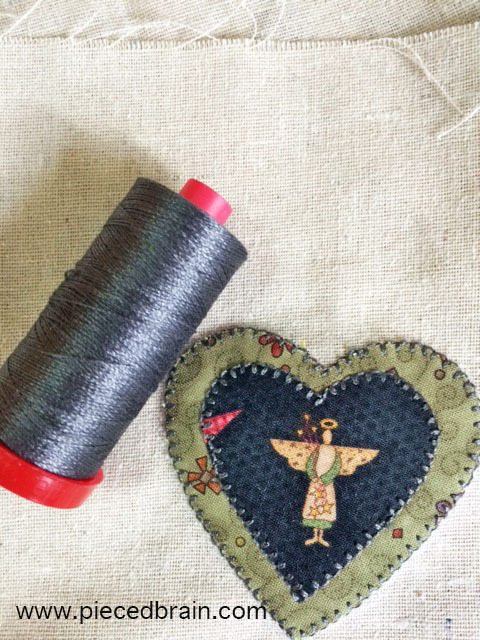 I am linking this on Friday to CrazyMomQuilts and Confessions of a Fabric Addict. Have a great day! So cute!!! I love the little pin cushions with the button pins. They look like fun designs with spectacular results. i just ordered it - so cool!!! It's gorgeous, love all the little details!